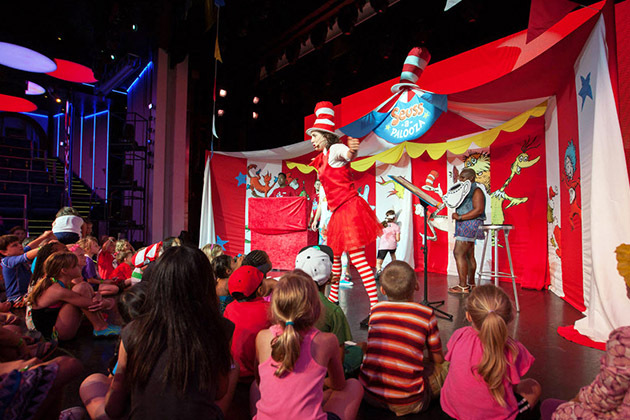 Carnival Cruise Line has themed many of its kids activities around the beloved Dr. Seuss picture books and their characters, such as the Cat in the Hat, Thing 1 and Thing 2. The cruise programming is collectively referred to as "Seuss at Sea." Green Eggs and Ham Breakfast: Kids and adults can pay a nominal fee for a sea day brunch, held once per cruise, done Seuss style. The main dining room is done up with whimsical and colorful decorations, and menu items include green eggs and ham and multicolored pancakes. Dr. Seuss characters make appearances for family photo ops. Seuss-a-palooza Parade and Story Time: The only event where Carnival sanctions kids marching through public venues and yelling, the Seuss-a-palooza Parade pairs costumed Dr. Seuss characters with the youngest cruisers as they wave signs and conga line through the ship. The parade ends at the Story Time venue, where the characters read and act out classic tales like "The Cat in the Hat" and involve audience members in the show. Dr. Seuss Bookville: Just three cruise ships, Carnival Freedom, Carnival Horizon and Carnival Vista, feature this family reading and play area, with a design inspired by Dr. Seuss' wacky world. The complete works of Dr. Seuss are available for reading; the room also houses art projects, toys and Seuss-themed games. In addition, Carnival screens Seuss movies onboard, offers Seuss-themed activities in the kids' clubs and has Dr. Seuss cruise room decorations, retail items and books for sale onboard. Most Seuss at Sea events are free. 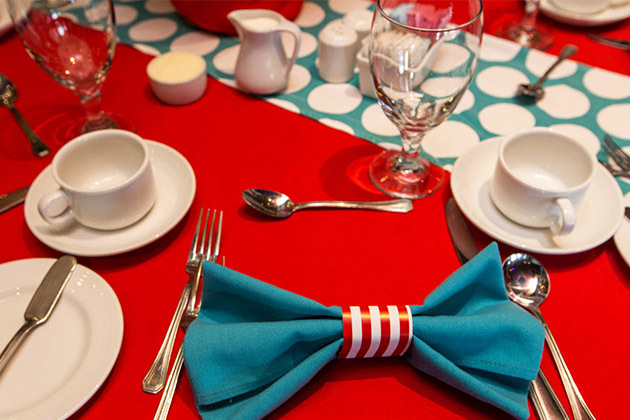 The Green Eggs and Ham Breakfast costs $5 per person (regardless of age), and souvenir Seuss items are priced from $8 for a lunchbox to $110 for the highest-priced cabin decoration package with multiple souvenir items. Seuss at Sea is found on all Carnival ships.